Few doubt how unsustainable current medical trends are. With medical inflation consistently outpacing the CPI, health costs will continue to take a greater share of the economy. Private insurers claim they can solve the problem with reform but without a Public Option. History suggests this is a dubious claim at best. 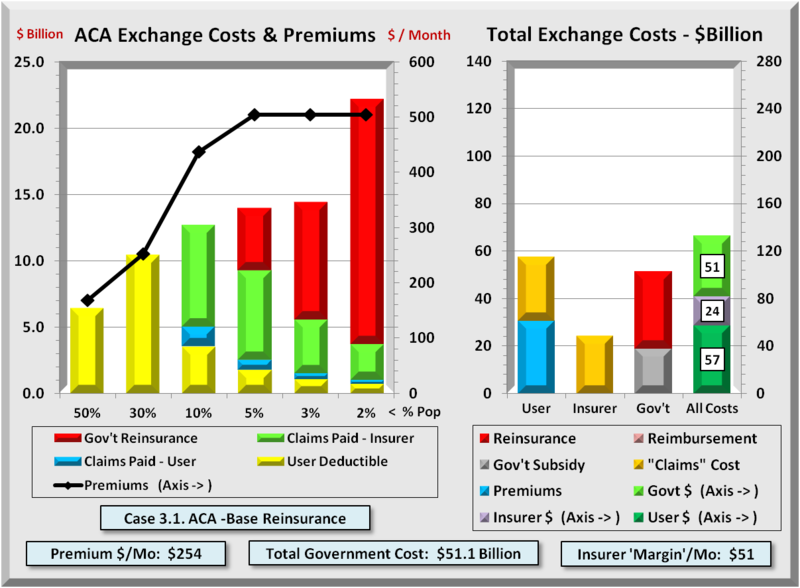 Looked at from multiple angles, private insurers are not likely to succeed. Profits gains have far exceeded key indices, medical loss ratios have gone way down while costs have gone way up, competition is diminished by concentration of major insurers, and tort reform complaints carry little water. 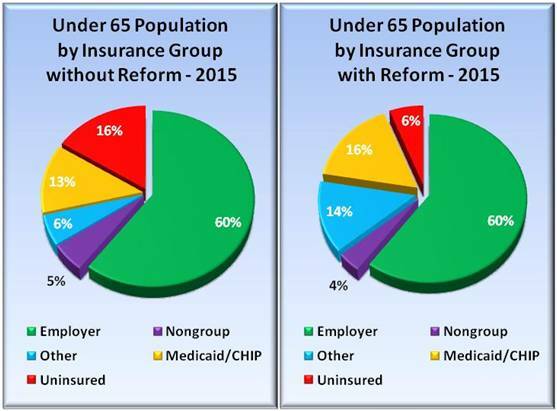 The graph below shows CBO projections of under 65 population by insurance group. 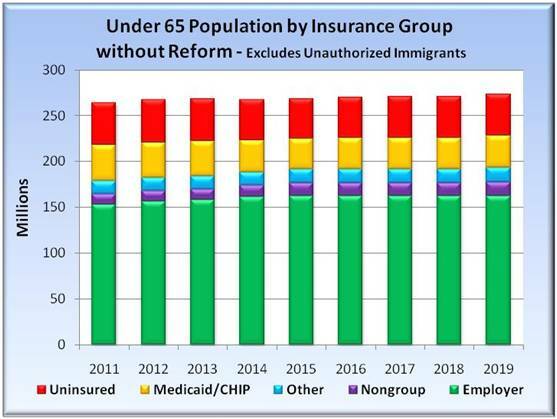 The top, red bars are the uninsured that continue to grow each year. While insurance through employment is fairly consistent, greater employee cost sharing is an increasing burden. Neither the Senate nor House reform proposals provide financial support to unauthorized immigrants. When analyzing various effects of reform, this group has no effect. For data consistency for both before and after reform, unauthorized immigrants are not included in the populations. 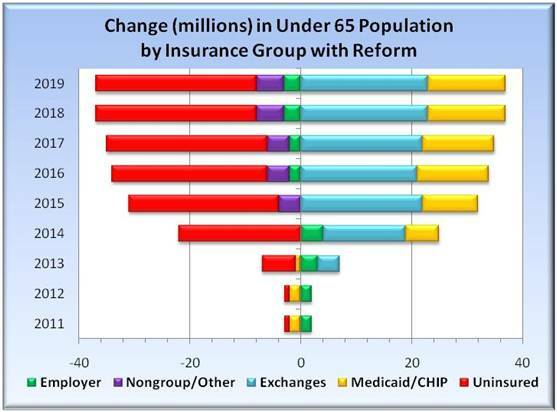 Removal lowers uninsured population between 5 and 8 million over the 10 year period. While the country may be coming to some agreement that reform is needed, differences exist on how to achieve reform. Health Insurers want to have participation mandatory which is a valid point. Except they have offered no other steps on how to reduce costs and are against Public Option that would offer real competition. However, they would be beneficiaries of millions of new customers. Those customers would come from those currently uninsured, or insured through individual and employer groups. 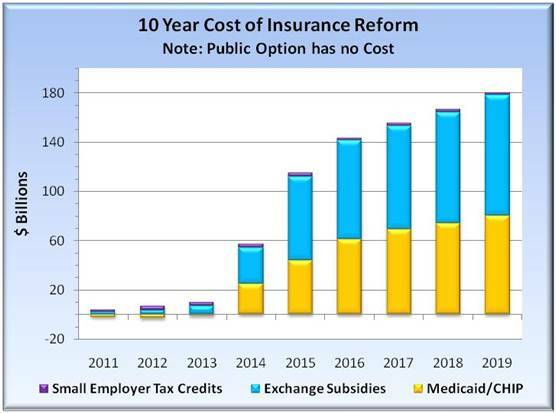 In the graph next column, CBO assumes reform includes an Exchange that would shift nearly 40 million from uninsured, individual and employer groups (left side of graph) to Medicaid and the Exchange (right side). Note that not all the movement is to the Exchange. A large number of uninsured poor would switch to Medicaid. Still, the Exchange is expected to grow quickly to nearly 25 million. 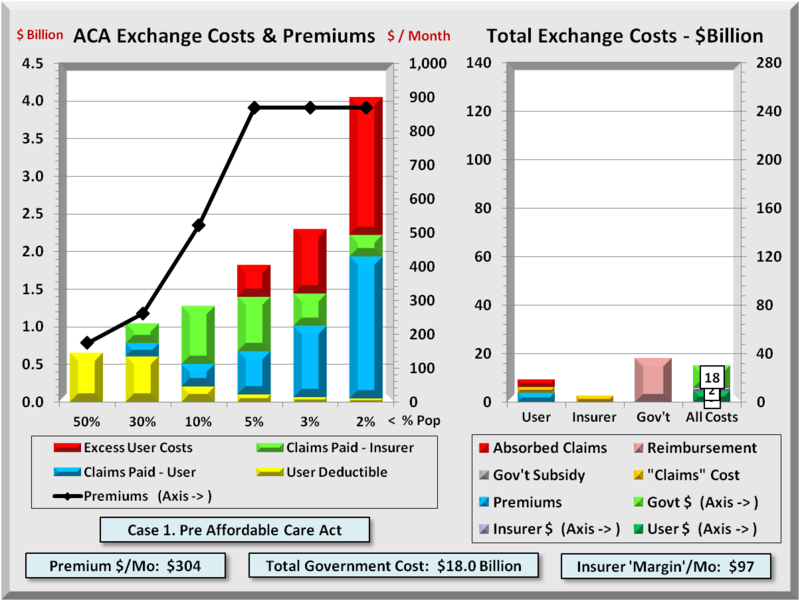 This group is the target for private insurers and Public Option. So why is it necessary to have a Public Option on the Exchange? On its face, private insurers could certainly cover 25 million new enrollees without government involvement. But the catch is that the government IS involved because of another feature of reform. That reform feature is “affordability credits”. Even those with insurance find their total health care costs consume so much of their income that they do not get needed care. Affordability credits help those with lower incomes pay premiums and shared health costs. The effect is shown in the chart below. Medicaid pays for the very poor while credits help less well off people in the Exchange. 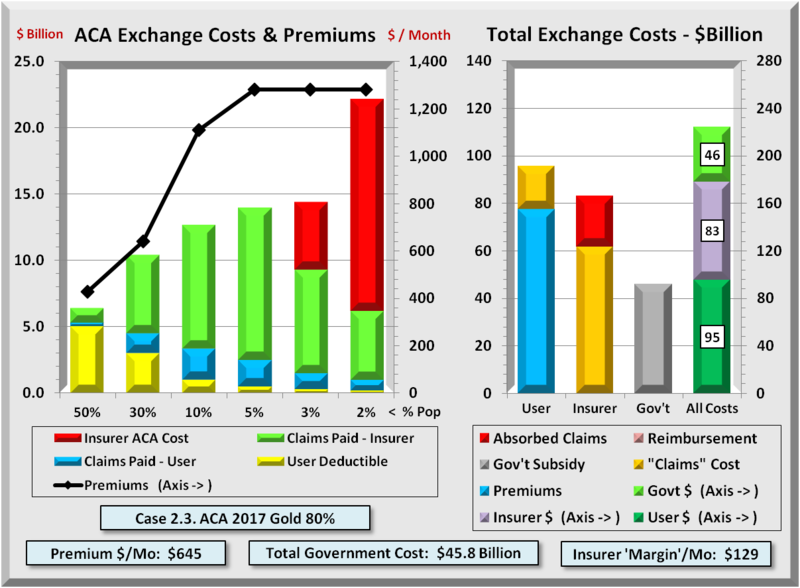 In short, the Government will be paying some $100 billion each year in credits to Exchange enrollees, much of it going towards insurance premiums. Will private insurers provide good value for this outlay? Their track record is not encouraging. 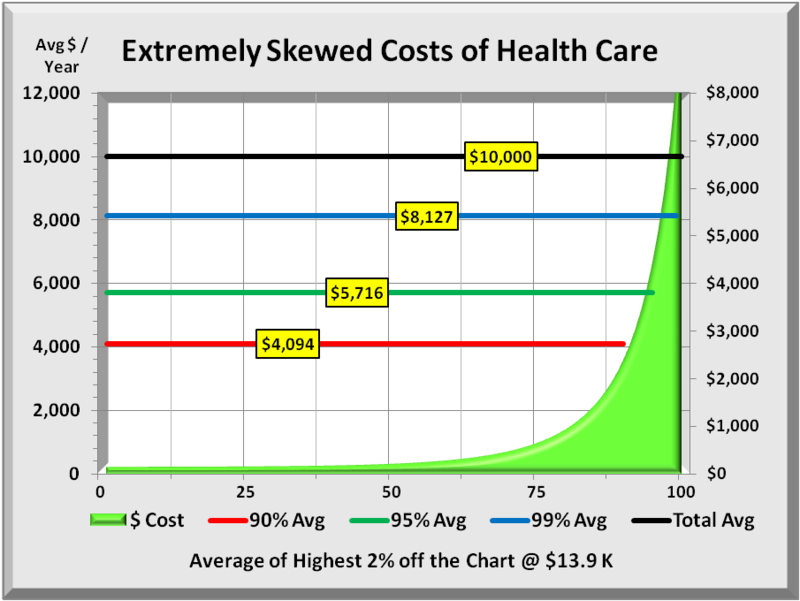 Health care costs fall into two categories: medical cost outlays and administration / overhead costs. 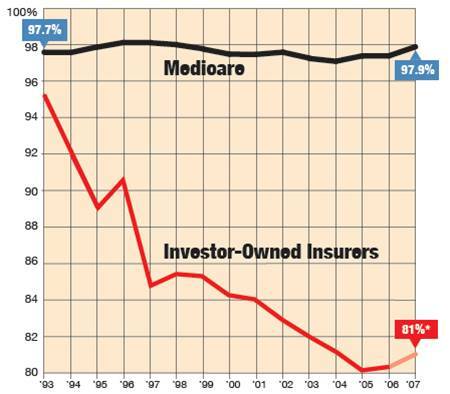 In 1993, 95% of premiums went for medical costs at Investor-owned insurers as shown below. Over the next 14 years, this decreased to just above 80%, a shift of about 14% or one percent per year. 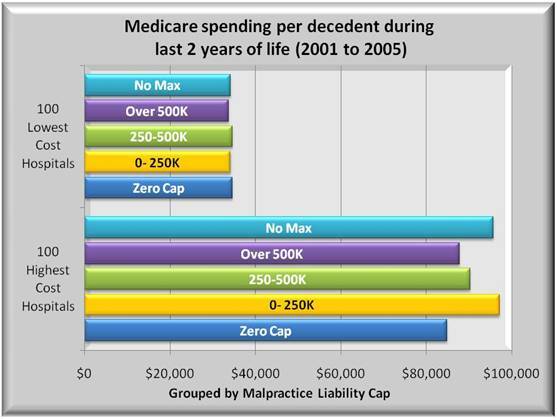 Meanwhile Medicare administration and overhead costs have remained fairly constant through the period. While some may argue this is not a direct comparison, the fact that Medicare medical loss ratio stayed constant while investor-owned insurers drop significantly cannot be denied. 14% becomes urgent when you consider premium dollars as shown in the chart below. 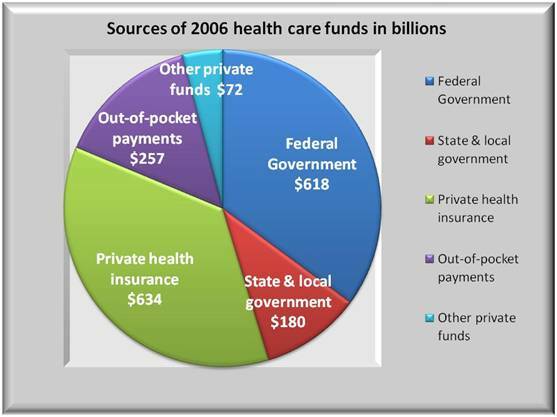 Private insurance runs over $600 billion. 14% of this is nearly $90 billion per year. Fortunately, one-third of private insurers are non-profit. But that leaves some $60 billion added overhead including contribution to profits since 1993. Profits did not grow to $60 billion, but they sure did grow as shown below, exceeding by a huge margin the S&P 500 and CPI for urban wage earners. All the growth occurred since 2002. Not only did investors do well, but so did executives and all at the expense of people paying for health insurance. 7 insurance CEO’s drew nearly $70 million total compensation in 2008. Still, Investor-owned insurers argue that their profits are a mere 3% of revenue. Another and better measure is Return on Equity (ROE) which is profitability based on investment. By this measure, health insurers are earning 17%. 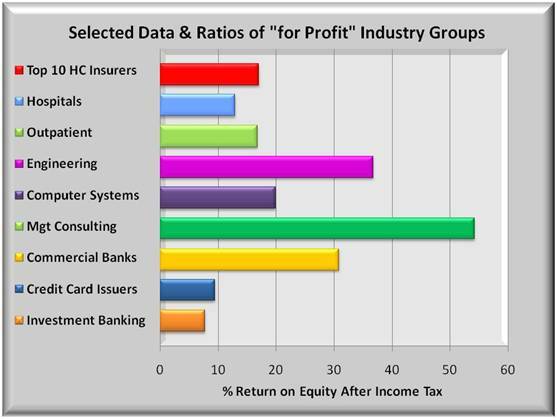 From the chart below some industries do have greater returns, but 17% should be nothing to complain about. The 10 insurers are even higher than credit card issuers. Now high returns to executives and investors might have some justification if private insurers were successful in containing and bringing down the major component of health care – medical costs. Yet, year after year, medical costs outpace the CPI. One could almost argue that insurers “administer” health care costs rather than provide a value added “management” of those costs. Competition often has something to do with companies holding down costs. In competitive markets, insurers need to maximize cost control efforts to maintain market share. But is there really competition? 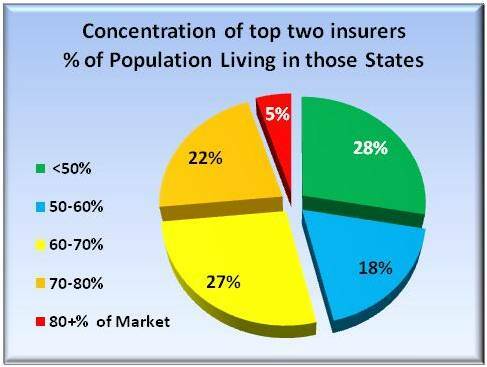 The graph below shows the market share of the top two insurers in each state weighted for population covered. Over half the U.S. population lives in states where two insurers control over 60% of the market. That is not a good omen for competition. For instance, insurers claim that their market share allows them to negotiate lower rates with providers. It would not be fair to paint all insurers with the same brush. But a number of insurers have been found not to be driving down rates, but of negotiating with providers to NOT contract lower rates with their competition. Instead of reducing costs, these illegal acts increase medical costs compared to a truly competitive environment. Insurers and others also argue that tort reform would bring down medical costs owing to current waste of defensive medicine. There is no argument about the waste. But is it due to defensive practice or simply practice? Data suggests that the latter is more prevalent. The graph below, derived from Dartmouth College data, groups two sets of hospitals, the 100 highest cost, and 100 lowest cost hospitals for Medicare spending per decedent during the last two years of life. 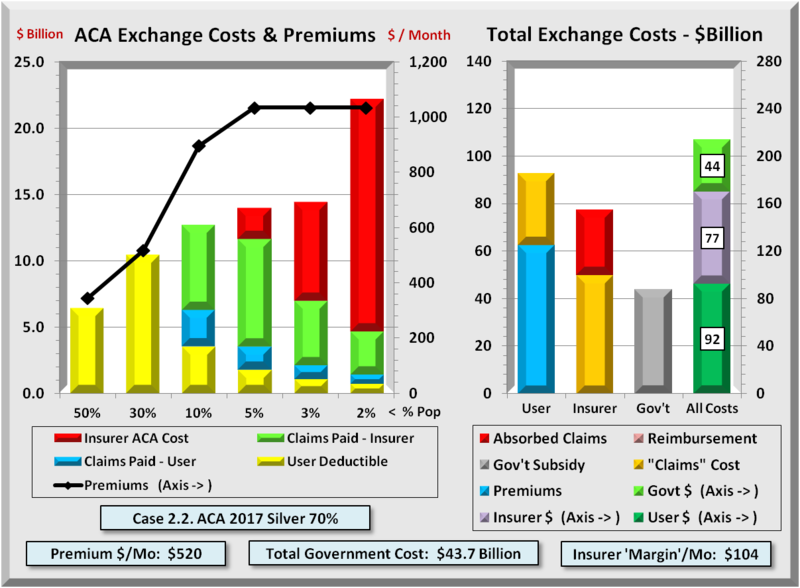 The bars represent average costs by states that have enacted tort reform setting caps on non medical damages. For the lowest cost hospitals, tort reform shows virtually no effect on hospital costs. For the highest cost hospitals, it is mixed. But there is no clear evidence that tort reform will substantially lower costs. 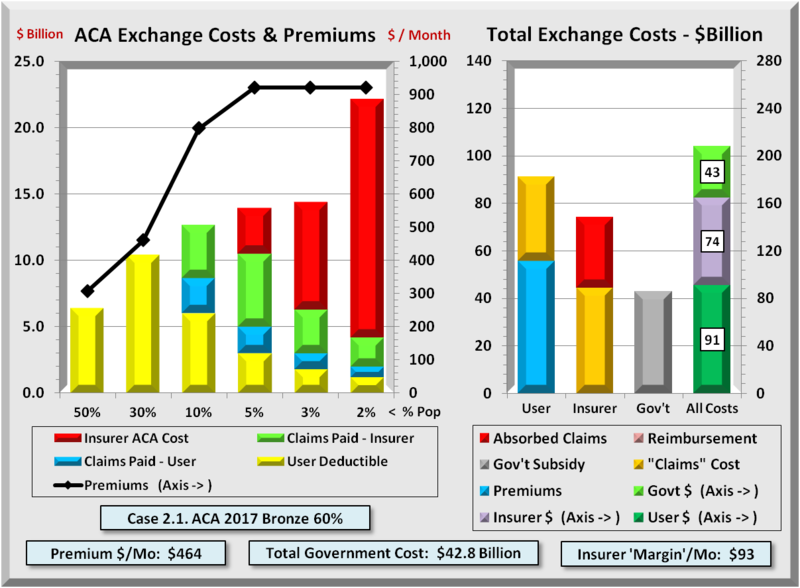 So far, private insurers’ track record suggests that left to the free market, they will not be very successful in lowering costs, either administrative or medical costs, with or without tort reform. It may be unrealistic to even expect investor-owned insurers to succeed given that their number one priority is to their investors. Instead of using their actuaries to data mine patterns to help providers reduce costs, their efforts are focused on denying claims and raising premiums to high claims groups. Instead of returning surpluses to people paying premiums, they are buying back billions of dollars of their own stock to increase value to their shareholders. Thus far the focus has been the cost of illness. Another aspect is the benefit of staying healthy. Corporations have had success in wellness programs. They not only reduce health care costs, but lower absenteeism. 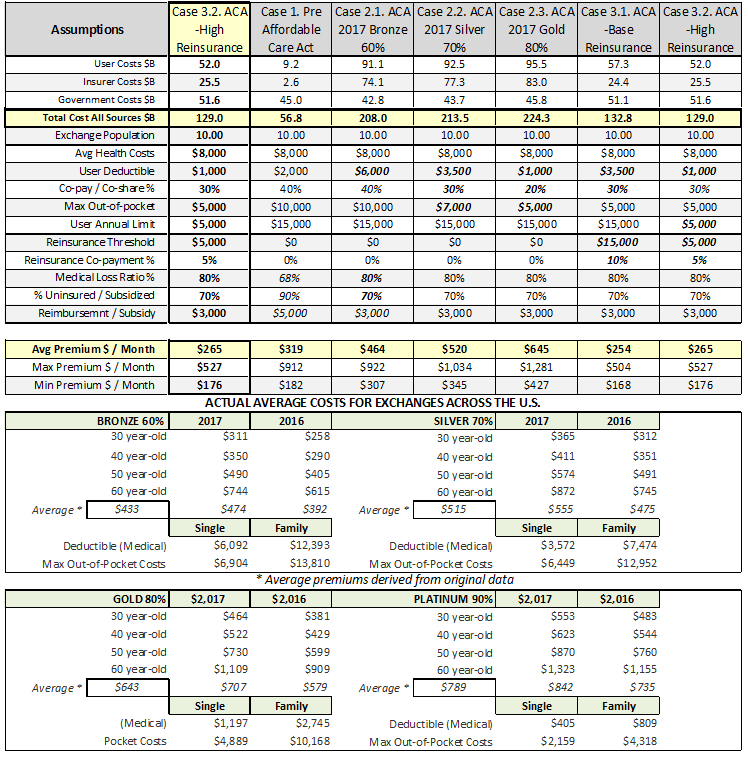 (http://www.uscorporatewellness.com/USCW White Paper 2009.pdf) Some insurers offer wellness programs, but they often include a health risk assessment on employees and that runs a risk that insurers may use that data in setting rates for the company: if towards lower rates, good. If higher rates, not so good. Fortunately, large corporations are the biggest block of insured people, and their wellness efforts can have a broad effect. 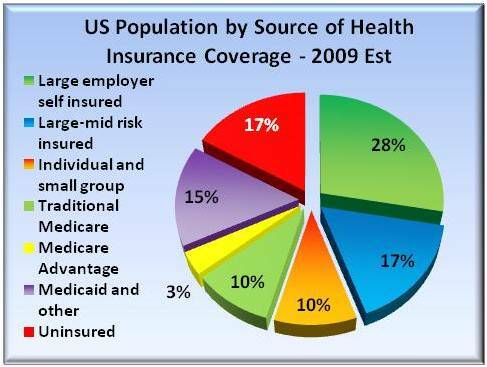 The graph below shows the U.S. population by source of health care coverage. Big business covers 45% of the population, 28% who self insure and another 17% who shift risk to insurers. Groups at a disadvantage to big business include individual and small group business and the uninsured that together make up over a quarter (27%) of the population. If private insurers are unable or unwilling to lower administrative and medical costs for them, then the next best alternative is to offer a Public Option. Without progress in both lowering administrative and medical costs, the affordability credit paid for by the government is going to cost taxpayers more than can be justified. The question is not whether a non-profit Public Option will succeed. The question is whether private insurers can succeed after years of failing to take the needed steps to contain costs. The stakes are huge. 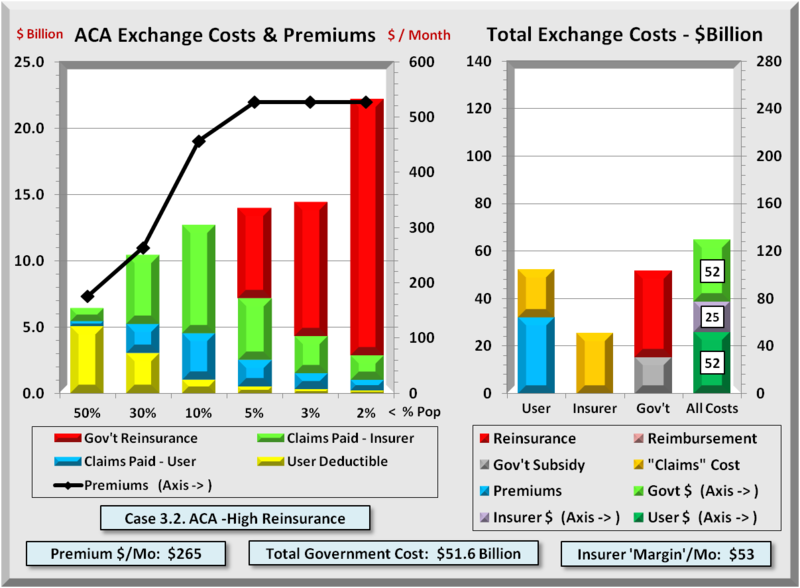 CBO projects that with a Public Option, the insurance picture changes dramatically as the graph below shows. Medicaid grows a bit for the poorest, but the uninsured and non employer based population can look forward to more affordable insurance. Meanwhile the majority of the population is unaffected. 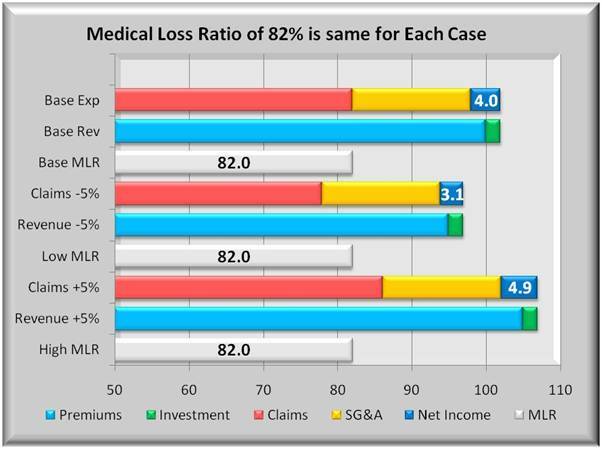 Medical Loss Ratio or MLR is a ratio used to measure what percent of Premium revenue for health insurance is paid out in medical claims. The remainder of premium is used to cover selling, general and administrative (SG&A) expenses as well as operating margin or profit. In the early 1990’s, the average MLR was over 90% and in 1992-1993 the MLR approached 95%. Though that may have been a high water mark for MLR, it was not unusual for MLRs in the 1980’s and earlier to be above 90%. 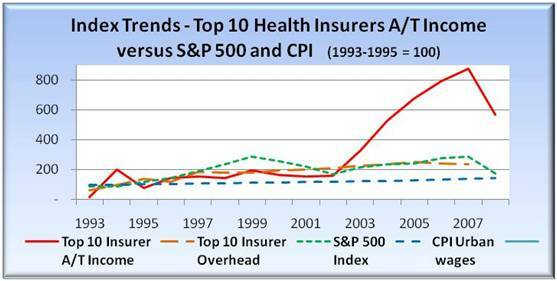 Health insurance companies ran the business with leaner overhead than is seen in more current times. suggest that the insurer either has a bad book of business or is not so well managed, either or both which could adversely affect profitability. MLR’s dropped fairly rapidly in the 1990’s and continued a more gradual decline to the low 80% levels in recent years. Health care reformers have focused on increasing MLR’s as a way to control health care costs. Since MLR by definition is a ratio of two numbers, one can increase the MLR by either reducing premium revenue, or by paying more claims from the same revenue. Since no one arbitrarily pays claims, forcing an increase in the MLR should put downward pressure on premiums. In that case, what expenses need to be cut. For them to focus on reducing claims does them little good as lowering claims does nothing to increase the MLR. For insurers to retain some measure of profitability, they have to look at cutting their general and administrative expenses. The graph below shows MLR trends from 1992 to 2007. In the early 1990’s, the average MLR was over 90% and in 1992-1993 the MLR approached 95%. Though that may have been a high water mark for MLR, it was not unusual for MLRs before 1990 to be above 90%. 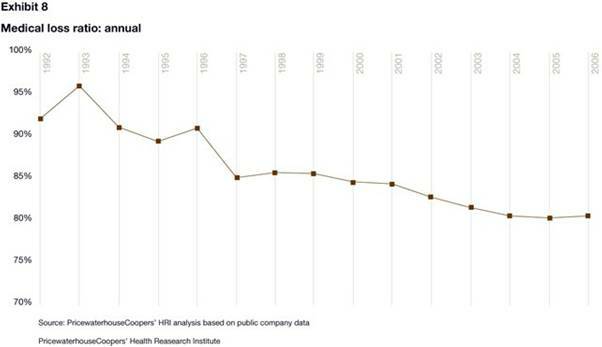 Then again, as one goes back in time, more health insurers were non-profit than there are now. These companies ran the business with leaner overhead than is seen in more current times. A critical question for health care reform is how fast and how far can these trends be reversed so that more of the premium dollar goes to medical claims instead of overhead expenses and profits. The graph below shows three cases, each with three bars. The base case is typical of today, the second assumes lower claims, and the third assumes higher claims. The first bar in each case represents claims, SG&A expense and profit margin. 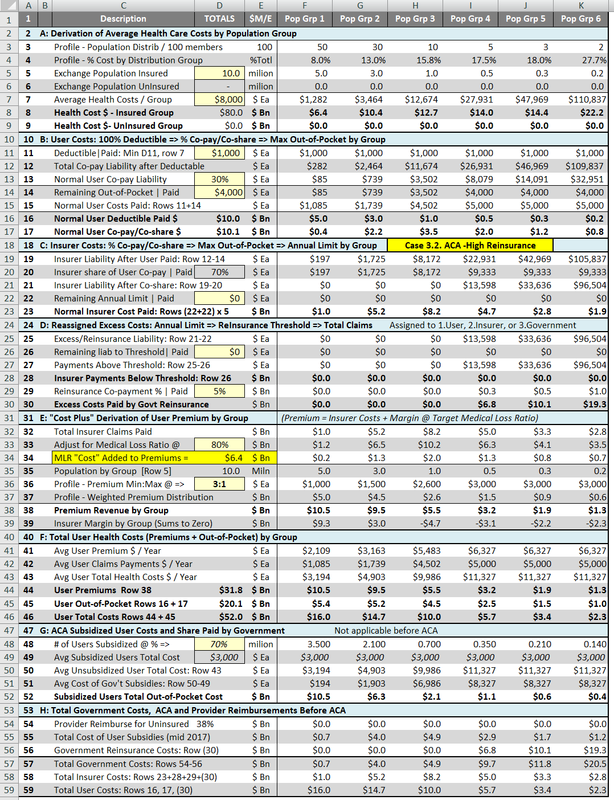 The second bar represents premiums and a small investment income (green). By definition, profit plus expenses must equal revenue so those two bars are always equal length. The third bar of each case is the MLR. In the second case, claims are lower. 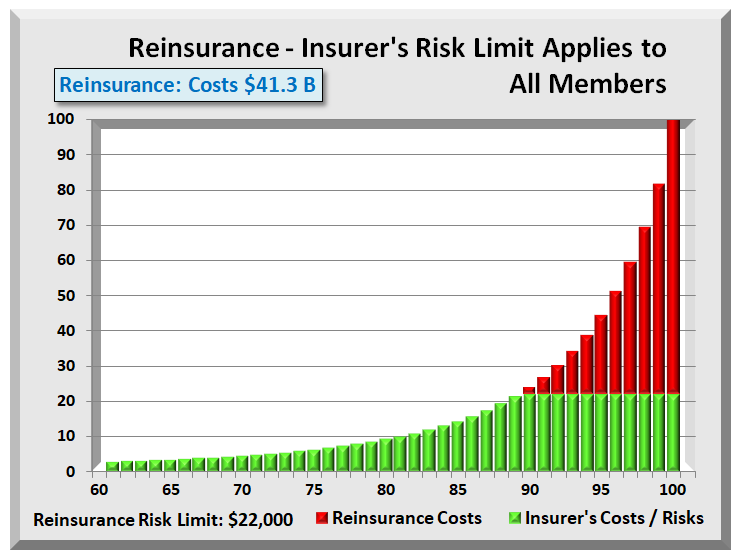 But unless premiums are reduced, the MLR will go down. Further the premium reduction will eat into profits to maintain the MLR. If claims rise as in the third case, and if the market will bear, higher premiums will generate added profits without incurring a reduction in MLR. The graph below shows the same three case format as the prior graph. The base case is the same as above. In the second case, however, both claims and premiums are reduced by 5%. It also assumes no change in profit or expense. In an environment of falling costs and claims, the MLR will decline by nearly one %. But the health care prices have been in an ever increasing trend. 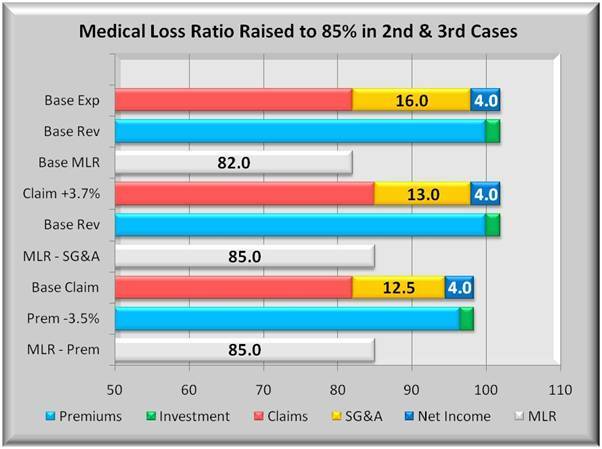 If overhead and profits are held constant, a 5% increase in both claims and premiums will raise the MLR by almost 1%. But as was shown above, the MLR continues to decline. 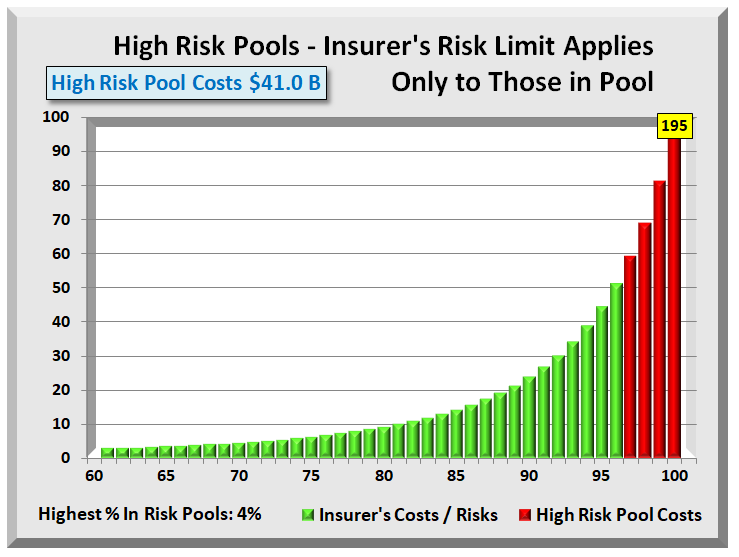 Unless there is competitive downward pressure on premiums, the profits will tend to rise and MLR’s decline. A key unanswered question is whether there exists enough competition to drive prices down or at least keep them from rising faster than general inflation. California is one state that is considering raising the MLR to a minimum of 85%, and increase from about 82%. The graph below shows two ways this can occur. The first is to hold premiums constant as claims rise to 85%. This will result in significantly lower profits unless overhead is sharply reduced, from around 16% to 13%. The second method is to reduce premiums to more quickly reach 85% MLR with no changes in claims. If insurers want to maintain current levels of profits, this method will require even steeper cuts in overhead expenses than in the prior case. Insurers can be expected to resist these moves. Still, one does not have to go back that many years to find total overhead and profit to be less than 10%. 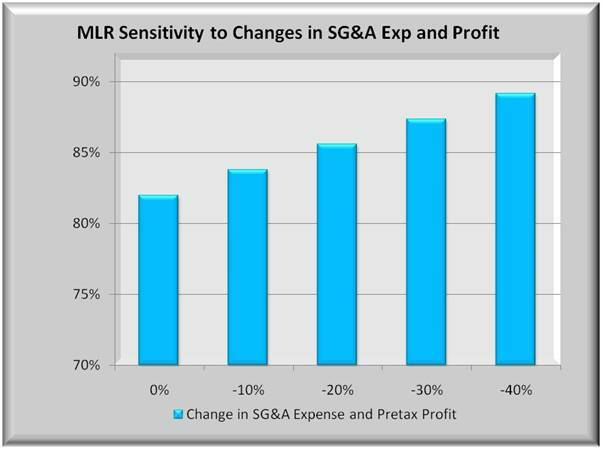 The graph below shows 5 bars representing decreasing levels of overhead and profit and their effect on MLR. Or conversely, how much do overhead and profit need to be reduced to reach higher MLR levels. For insurers to reach an 85% MLR without increasing premiums, they will need to reduce overhead and profits by some 20%. An 88% minimum MLR would require reductions of 33%. Health care reform should allow for significant cuts in general and administrative expenses. With insurance exchanges, selling expenses may be reduced. But it is hard to imagine the levels of cuts needed to help bring about cost control without some reduction in profits as well. If this nation is serious about reform, it is optimistic to think that insurers’ profits will remain relatively unaffected by these changes. But the high tech industry had a nice ride to new highs, before it was brought back to reasonable levels.